Let food be thy medicine: I think herbs and spices when I think about the healing powers of foods. Different peoples have been using food, herbs, and spices for centuries to heal and promote health. While there are countless other herbs and spices that have anti-inflammatory benefits, here are some commonly-found ingredients that are used in a variety of cuisines. 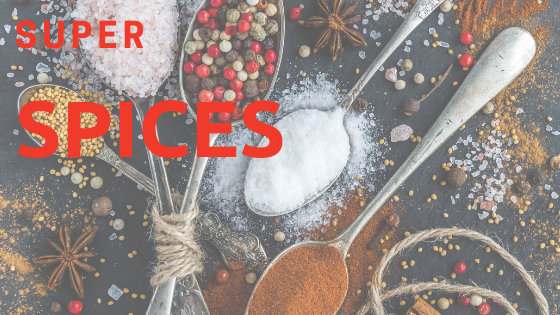 Herbs and spices add variety to your foods, and can make a plain meal or dish seem far more exciting! Ginger: not only invigorating and tasty, ginger has been shown to have anti-inflammatory benefits, soothes a stomach ache, and aid in inflammation and joint pain. Turmeric: contains curcumin, but best when taken with piperine (black pepper) and fat to boost absorption. Curries! Cocoa: the flavanols in cocoa can help reduce inflammation, and cocoa is a great source of magnesium. Choose at least 72% dark chocolate (the darker the better!) to reap the most benefit and avoid too much added sugar. Cinnamon: demonstrated to help with joint inflammation and act as a mild analgesic, cinnamon is also a great spice to use to increase the sweet flavor of your food-sprinkled in oatmeal, or a smoothie, or in teas. Garlic: so good for your cardiovascular system, joint pain, and arthritis symptoms. If fresh garlic has you running for your toothbrush, try roasting a whole head to mellow the flavor. Most herbs and spices should be easy to obtain now, especially with the internet. If your regular grocery store doesn’t carry organic spices, you can look for Asian, Latin, or Indian grocery stores that tend to carry larger varieties of spices, and some of the unusual ones. It’s easy to grow fresh herbs inside on a window sill, or outdoors in a pot or in your garden, too. Then just harvest as needed. Ideally, you would buy your herbs and spices in small enough amounts to keep them fresh and potent, but if you buy in bulk, try to buy them whole, and keep in an airtight, dark container, until you’re ready to use them. Otherwise buy in smaller quantities and replace often. Ground spices should last less than a year, and whole should last 2-3. Keep spices in a dark, airtight container, and keep away from heat! Prepping your spices: many spices will benefit from a little heat to release the oils before you cook them-lightly toast spices in a small and heavy frying pan (let it heat up for a few minutes), then toss the spices on the pan, and keep stirring regularly until the spice smells very aromatic, and starts to change color. This can take a few minutes! Need help figuring out how to eat anti-inflammatory? Come meet with our nutritionist for more information, including a detailed and personalized plan.